The ear drum – also called the tympanic membrane – is a thin piece of skin that separates the middle ear from the ear canal. It is part of the sound conduction pathway leading sound into the inner ear. In rare cases, the skin from the ear drum grows underneath the ear drum into the middle ear, forming a cyst-like structure full of dead skin. This is called a cholesteatoma. A cholesteatoma can be found in the middle ear or mastoid bone. In rare cases, a cholesteatoma can extend into the brain through the thin bone separating the ear and the base of the skull. Occasionally, cholesteatomas can be congenital and occur in patients without any history of ear problems. If you have one or more of these symptoms, make an appointment with an otologist immediately. A cholesteatoma can usually be diagnosed during a clinical examination and without additional testing. In most cases, your surgeon will request a formal hearing test to determine the amount of hearing loss you have, if any. Occasionally, your surgeon may request that you undergo a CT scan or an MRI in order to provide additional information about the size, location and extent of the cholesteatoma. 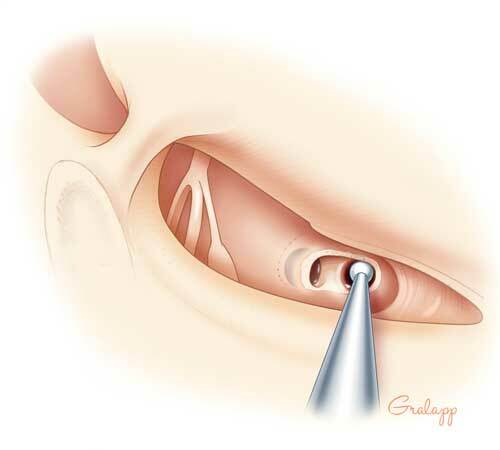 Initial treatment is often aimed at resolving infection, pain, and drainage from the ear. This often involves in-office cleanings as well as both oral and topical antibiotics. In some situations, once the infection has resolved, the cholesteatoma can be managed conservatively with frequent exams, hearing tests, and microscopic cleanings in the office. In patients with very aggressive or extensive disease, a second surgery is often done nine to 12 months later to ensure complete elimination of the disease. If there has been damage to the hearing bones, hearing reconstruction can also be done during this second surgery.